Well done! Very good and informative. Noticed a typo, under the Sword tab. You typed "Legionaries"
Apart from that good guide, will come in rather handy. You're missing Skullforge Reaver in "Drops" part. Dude, you're COMPLETELY missing Krol Blade... Forget it, I didn't noticed that the character I see was Monk. Props on the guide. I appreciate the info. Should be noted that the two axes obtainable via questing are alliance only. Spell Axe of the Speaker and Battleaxe of the Speaker do not sheathe on the back. There are multiple maces that sheath on the back. I'm using cobalt tenderizer and anvilmar hammer and they both sheath on the back. At least on my monk they do. I believe Spiteblade from Netherspite in Kharazan also shares the same model as Hope Ender. It's worth mentioning that the 463 Blacksmithy crafted Masterwork Ghost Shard is a dagger sheathed behind the back, although it does become invisible once sheathed. Pretty cool if you prefer both a hidden weapon + the back sheathing animation. In 5.4.8 Brushwood Blade no longer sheaths on your back. Stung doesn't sheathe on your back (anymore). I would recommend changing the location for Broken Promise to The Four Horsemen. If you do FH 25 it has a moderate 16% drop rate, on Gluth that drops down to .05-.10% so anyone farming it there will likely be waiting a longggg time. If you look at other sources they list it as Four Horsemen because that's really the easiest way to get it. Great guide! Just thought it was worth mentioning that the Yaungol Fire Carrier is now transmogable! Quick update for WoD, two weapons you get from doing Challenge Warlord: Gold sheath on your back. Namely, Shifting Felblade and Elemental Crescent. I don't know if you're still updating this but the Battleaxe of the Speaker/Spell Axe of the Speaker rewards from the Horde Shaman quest do NOT sheath on your back. I wish they just made the option to sheathe a weapon on the back, Would be much better...Theres so many awesome looking weapons out there which just look plain stupid or ugly because they dont sheath on your back most of the time. I hope it will be a option one day. Additional sword that is back sheathed. very cool. Slight Correction: At least as of a month ago, the Twinblades of the Hakkari were still in game- my hunter got the (formerly main) one-handed Warblade of the Hakkari Warblade of the Hakkari. i would like you to know this does not seathe on the back anymore. 90% sure the Hanzo Sword Sheaths on the back. Sorry I'm not sure how to link things properly but that's a sword that goes on your back. You can buy it from Dealer Jadyan, a vendor in Stormspire, Netherstorm. This is a bit late but Shifting Felblade also sheaths on your back. I guess if the owner of this guide ever comes back, he/she can put this under "Unobtainable." Awesome and very extensive guide! As of 7.0.3, with the new transmog system, Heavy Copper Longsword uses the model of Darkthorn Piercer which unfortunately forces it to sheath at the hip. Brushwood Blade no longer sheaths on back. Sheaths on hip for my Demon Hunter. The warglaive like, Warmongering Combatant's Quickblade and presumably its identical siblings count as 1H swords and also sheath on the back. You might want to add that you need to be Deathknight (or Shaman) to gain Sunstrider Axe from the quest. the phantom blade's pattern isn't rare, it's a drop off of like 10 placed mobs and a decent one. Uusually it's 2-5 runs killing these and nothing else as a cap and you have it. Dread vanquisher's hacker From the legion invasions also sheaths on the back. I have Brushwood Blade, and put it on my DH as a transmog weapon, and its not on my back, its on my belt, as any other sword:(! So maybe it depends on what class u are? Does this mean that a fire mage can transmog their legendary to one of the one-handed swords that sheath onto the back? And not have to carry around the sword in hand? I saw a fire mage earlier tonight and he/she had the sword on the back rather than in-hand so I was hoping it could be true! I would love to play fire but just cannot get into the sword carrying part. Spell Axe of the Speaker is now sheathed on hip, not back. As is the sword "Stung". Dread Vanquisher's Hacker is also an axe that sheaths on the back. Element-Infused Knuckles Can be Sheathed on your back as well. They are FIST WEAPONS ! Is there still only 1 option for daggers that sheath on the back? As a sub rogue, it's infuriating because I LOVE weapons sheathing on my back, but there is only one xmog for it. 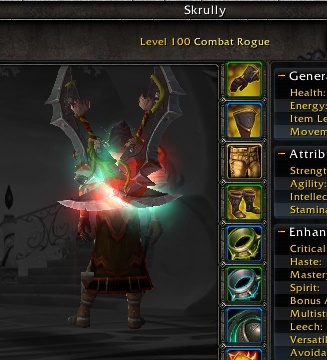 Blizzard should really make it an option to be able to sheath your weapons on your back or hip, or at least make it so you can use the legion artifact xmogs for any spec as long as they're the right weapon (for instance, I could use the assassination artifact xmog to have daggers that sheath on the back).